William Larrabee Jr., born December 11, 1870 in Clermont, Iowa. When he was 5, the family moved into the newly completed Montauk. He had 3 years of liberal arts and 3 years of law school at University of Iowa and played football and baseball. During his senior year, he was a member of a scientific expedition to do exploration work in the Bahamas and Cuba. 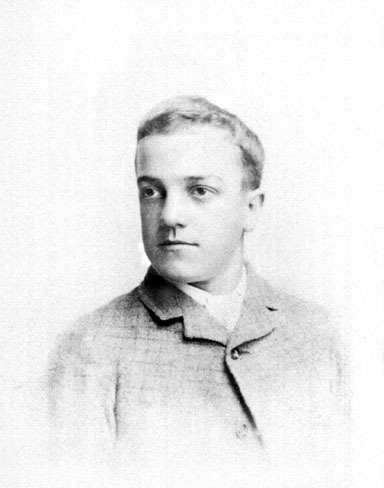 During his last year of law school (1896) he was a member of the Phi Kappa Psi Fraternity. He was graduated in 1896. William Junior as a teen. He served as captain and commissary during the Spanish-American war, having volunteered as a private and afterward been promoted. He was a member of the 52nd Iowa infantry volunteers. While in Cuba, he contracted malaria. Politically, William had always been a stanch supporter of the Republican party and had taken an active part in public affairs. In 1901 he was the successful candidate of his party for representative in the Legislature and served in the twenty-ninth General Assembly. In 1908 he was again elected a member of that body and in November, 1910, was reelected. William also served several years as a member of the Clermont school board. He was a member of the Masonic Lodge. On September 4,1901 he married Lillian Grey Inglis in Middleton, Connecticut at the Holy Trinity Church. They lived in the house of Montauk until 1913 then moved to a house they had built at the bottom of "Montauk's" hill. During the 12 years they lived in the Montauk house they had William Inglis (died in infancy), William III born in 1904; Lillian Innes, born in 1906; Helen Augusta, born 1911, and the twins James and Janet born in 1915. His wife Lillian lied about her age early in order to be able to teach school. This Led to doubt later about how old she really was. She was one of only 2 women at Connecticut College (Class of 1896) when it was considered an all boy's school. Lillian was an excellent student in math and Latin. She taught school at Saint Katherine's in Davenport, Iowa, an Episcopal girl's school. Lillian was President of Iowa Federation of Women's Clubs. In Clermont she started a women's club. She wrote poetry (serious and humorous) and often corresponded with others in Latin. William lost most of his wealth in the market crash of 1929. He passed away on April 1, 1933 due to complications from gall bladder surgery (embolism).